DURHAM, N.C. – Welcoming a new child into the family is a life event that brings joy, love, anxiety and hard work for parents. 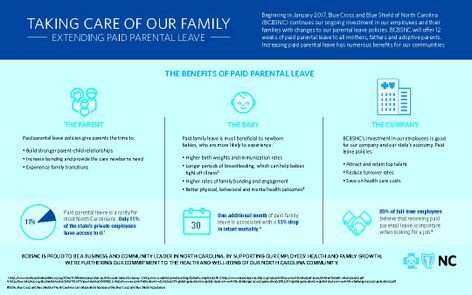 Blue Cross and Blue Shield of North Carolina (Blue Cross) is proud to announce an expanded paid leave policy for employees which recognizes the importance of the transition of a growing family. Blue Cross extends paid family leave for 12 weeks to mothers, fathers and adopting families beginning in 2017.